Little is dreaded more in the Mac world than the kernel panic, the Mac OS X equivalent of the Windows Blue Screen of Death of yesteryear. While modern versions of Mac OS X don’t display the kernel panic screen like they used to, that doesn’t mean you still can’t have some mischievous fun with a fake kernel panic screen saver. Similar to this fake kernel panic app, the Kernel Panic Screensaver draws what looks just like a real kernel panic on the Mac display, leading yourself (or the unsuspecting observer) to think a Mac has suffered from a total system failure*. The effect is very realistic, complete with the slow screen draw and the multilingual kernel panic text just like you’d see in the real thing. Thankfully, real kernel panics are rare, and this is obviously just a fake one anyway that goes away the moment you move the mouse, but that doesn’t mean you cant have some fun with this silly replica of Mac computing disaster. This fun little screen saver comes to us from DoomLaser and was first released a long time ago, but it continues to be compatible to this day with modern versions of Mac OS, even if the kernel panic looks different and no longer behaves the same. For best results you’d probably want to install the screen saver file called KPSaver and then set an appropriate time for the screen saver to activate, or just enable the screen saver as usual and let it activate the fake kernel message in time. 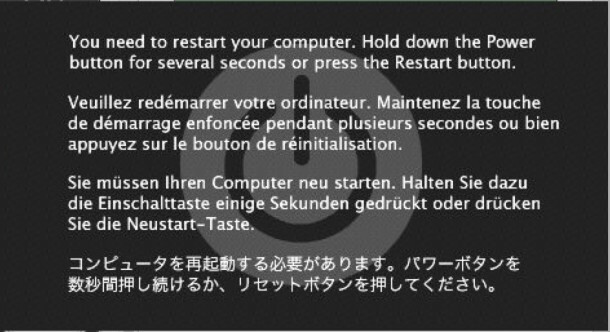 You can also use it yourself to enjoy the humor in a simulated kernel panic as your screen saver, since it looks silly and your co-workers might think theres a problem on your Mac when there actually isn’t one. Sure it’s a bit goofy, but sometimes having a little fun is warranted, right? Just remember to be a nice person and don’t use this joke the wrong way! As soon as you move the mouse or press a key the screen saver goes away, that is how a screen saver works. Good idea, but I’m afraid not new. I would have imagined that since mac started using the unix kernel they’d know about the standard BSOD screen saver. I have to admit that the screensavers alone are half of what made me try linux, but seriously it was pretty much a stock option in most distros. Good rearticulation of the idea though. One of my favorites for an office is putting tape on the bottom of the optical mouse, since it’s easy to fix and remove, but it makes using the mouse totally chaotic and inaccurate. Cracks me up every time. Office humor is good. A lot of people need to lighten up. “The Mac OS X equivalent of the Windows Blue Screen of Death of YESTERYEAR??? The possible positive outcome of this is that it may encourage the ‘attacked’ portion of the community to protect their Mac by using a Password to gain access? Roll on Fingerprint ID Access for Mac OSX. Who knows, those with time on their hands to pull stunts like this may also consider preventing it to happen to themselves? Pity OSXDaily has dragged this time waster out of the trash while they have an abundance of really useful and worthwhile material to reveal. Shouldn’t every computer user already being protecting their Mac with a password? If someone can install a screen saver on your Mac… or log into your Mac in general, you need to put a password on that thing ages ago. Every personal device needs password protection, too many risks to not have passwords! Back in the days before OS X, there was a little system extension called Cheep. Periodically, a little bird would go: peep, peepeep. I stuck that onto the Mac of a particularly obnoxious Ad Agency ad sales guy. His office had a window looking out onto the patio. He complained, and I said, “ah, no. Those are just the birds outside in the tree.” He never mentioned it again. Now THAT is fun and funny. I remember an app like that, would be easy to recreate today in Automator or something similar. Funny! Good old pranks, pranks are fun. Highly irresponsible. Given the personal and confidential information accessible on our computers today, sneaking software onto another person’s computing device is akin to breaking and entering. The victims should reasonably assume that more serious malware/spyware may have also been planted. It deserves the same response as someone entering your home without permission. It’s a prank Robert, like a digital whoopee cushion. Sorry you have no sense of humor. YOUR CAPS LOCK KEY IS ON AS WELL. That’s a little extreme Robert. Why are you so angry? Too much coffee this morning? Do you wish harm on everyone who has a little fun or suggests something may be humorous? Relax, deep breaths, jokes are jokes. It will be OK. If you don’t like it, don’t use it.